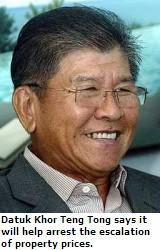 The state government has raised the density for property development in Penang, which will bring down land cost and stabilise property prices, said Hunza Properties Bhd executive chairman Datuk Khor Teng Tong. “The state government recently decided to increase the density to 280,000 sq ft in built-up area from 90,000 sq ft per 100,000 sq ft of land.The decision to increase density will allow developers to build more, hence giving consumers more choices. “It will also help arrest the escalation of property prices over the next few years,” he said at a company briefing for the media, analysts and bankers. On the group’s projects on the island, Khor said Hunza would finalise the design plans for a “green” apartment building project on a 4ha site soon. The project was expected to contribute strongly to the bottom line of the group for the financial years ending 2011 and 2012, Khor said. On the Gurney Paragon project, Khor said the designs and plans for the shopping mall had been finalised and submitted to the relevant authorities for approval. “We hope to start work by early 2010,” he said. The seven-storey shopping mall will have a gross built-up area of 1 million sq ft, of which 650,000 to 700,000 sq ft would be lettable. On the property market in Penang, Khor said property was currently in short supply. “The shortage of supply is mainly due to a slowdown by developers. Not many new housing projects have started in the past one year. Hunza is finalizing the design plan for "green" apartment. Can anyone help me to understand what's "green" apartment? What's the advantage of "green" apartment? Apparently Jeremy you do not speak fluent english from the way you construct your sentences. The funny thing is that you go around commenting about people's english and how mangled it seems to be from your perspective. "What are the advantages of a green apartment"
"Can anyone help me understand what is a green apartment" There is no need to add the "to". Nevertheless, let me explain to you the concept of a green apartment. Basically, a green apartment is based on the concept of low impact living. It means having appliances and utilities which are more efficient in terms of energy usage. Hence, saving energy,saving money and indirectly you are preserving the environment by emitting less of CO2 to our atmosphere. Hopefully that helps to clear things up a little bit. Stop being the kettle calling the pot black. You definitely have better English than I do, but I don't remember commenting on anybody's English in the blog. Anyway, "Jeremy" seems to be too common in the property blogging. 1) Is Green Apartment something new in Malaysia? 2) Is this for marketing only, or there are real benefits? 3) Will developer charge more for Green apartments? 4) Will Green appartments fetch a better price, and are purchasers willing to buy? 5) Will you buy a Green apartment? Last but not least, you may continue to comment on my English so that the rest can also learn from you. jeremy tan..people in glass houses shouldn't throw stones.. your sentence "Can anyone help me understand what is a green apartment" is equally incorrect. Going by the rules of English grammar you cannot have two question forms making up one single sentence..that is " Can anyone help me understand..." used with"What is the meaning..." The correct sentence should read "Can anyone help me understand what a green apartment is?" You are no different from a lot of non-native speakers who think they speak and write good English but in actual fact make basic grammatical mistakes. Ha Ha... that's a good one, k! Thanks for correcting me. Just to highlight my intention was to remove the "to" from his sentence and was not aware of the mistake.It was his mistake which i just so happen to copy and paste without noticing it. You are no different from a lot of non-native speakers who think they speak and write good English but in actual fact make basic grammatical mistakes. Thanks for all the critics/feedback. Let's use this platform to its original intention, ie. Penang Property Blogging. 2) Is this merely marketing, OR there are real benefits? 3) Will developer charge extra for Green apartments? 4) Are purchasers willing to pay for the premium? 5) Will you buy a Green Apartment if given a choice? - a white kid who has a low mental growth or simply stupid can still speak perfect english..
- a japanese arithmetic math professor in Japan can speak the worst English in the world but solves the hardest math problem in the world..
'whos the smart one now' the kid or the professor.